You may already have seen videos of English Labrador retriever, Stella, in your Twitteror Facebook feed, and what a welcome clip it would be! This yellow ball of energy is enthusiastic about all the seasons, but none so joyously as Fall. 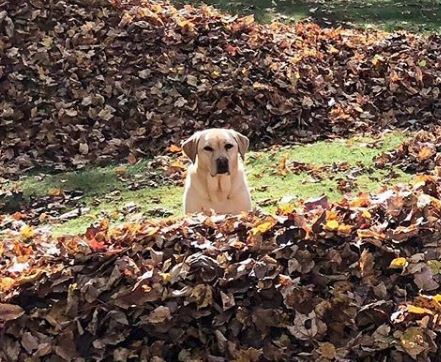 This Maine pup is 5 and her enthusiastic leaps in the leaves have been garnering her lots of new followers on her already popular Instagram account. 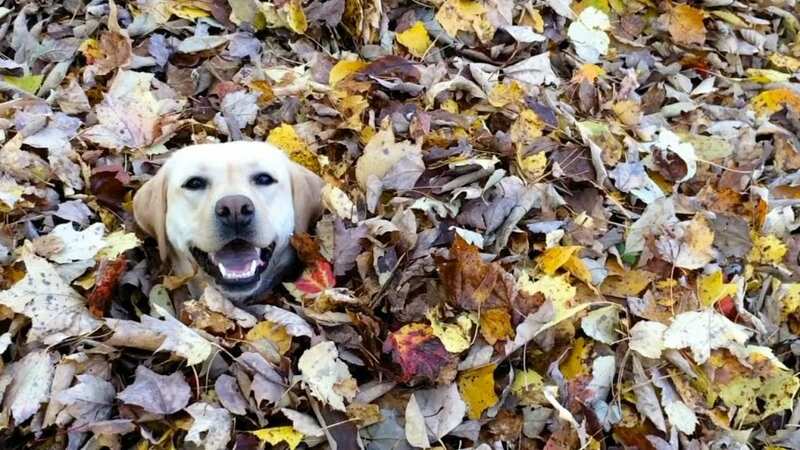 Stella, like so may Labs, loves the water — from pool to puddle to lake to hose — but she is happiest when the trees bring forth their fall bounty in which to leap. And she looks extra smashing in her bumblebee costume, flying into the Fall piles. And here she is, a happy queen in her autumnal realm. So cute! 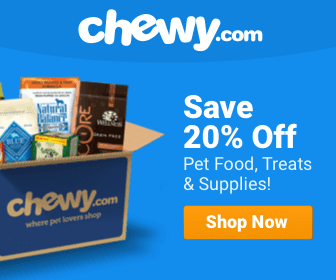 Other things to do with your dog in Fall…. Sure, you’ll have to find a dog-friendly pumpkin patch, but what’s the Internet for if not that! Everyone does this ubiquitous photo with their kids, so why not either add your dog (or do a shot that’s JUST your dog; who needs a human kid for a cute punkin-patch pic!?). We know dog lovers have mixed emotions about this. Some of you love it, some quite the opposite, but many costumes are no different than a sweater you’d put on your dog to keep warm anyway. Most communities have venues with dog-friendly Halloween events and as long as your dog is comfortable and able to move freely, he or she can have just as much fun as a person. Never leave your dog in costume unattended! The gorgeous, crisp weather is ideal for a refreshing stroll outside, something your dog will love no matter where you go! Be sure to choose a path that not only fits your fitness level, but also your dog’s. Bring water and snacks and bags for clean-up and for your dog’s safety, keep him or her leashed!